I HEART EXCESS BAGGAGE: Jambo from KENYA! After spending a relatively somber April in Rwanda, I was itching for a change of scenery. Peter, a GHF from Pfizer China, working with PSI in Nairobi wrote and told me that he was planning a safari for the Easter holiday. I replied with four magical words: "TAKE ME WITH YOU!" Nairobi is the capital of Kenya, close to Rwanda in East Africa. The one hour flight from Kigali to Nairobi was pleasant and I arrived shortly after 8pm on Thursday April 21st. I spent the night in Nairobi with Elaine, another GHF from Pfizer Singapore. Early the next morning, our safari driver picked us up at Elaine's apartment and then we went to pick up Peter and his wife Cindy. After driving close to six hours, we arrived at the Mara Simba Lodge located in the heart of the Maasai Mara National Reserve. We spent the next two days eating delicious food and seeing lions and leopards and elephants, oh my! I had the most amazing time catching up with Peter and Elaine as we discussed our fellowship adventures and danced to local music. 2. Maasai: refers to the people that make up the Maasai tribe found in southern Kenya and northern Tanzania, along the Great Rift Valley. The Maasai people can be identified by their red clothing, shaved heads and beaded jewelery. They are a nomadic tribe famous for herding cattle and drinking "milk blood", a concoction of cow's milk and blood. Maasi men are also known as warriors who hunt lions and other predatory animals as a rite of passage. An interesting fact is that during the colonial period, the Maasai people stood against slavery and lived alongside most wild animals with an aversion to eating game and birds. Maasai society never condoned the trafficking of human beings, and outsiders looking for people to enslave avoided the Maasai. 3. Big Five: All members of the "Big Five" (lion, leopard, African elephant, African buffalo, and Black Rhinoceros) are found in the Maasai Mara. The cast from the Lion King can be found there as well, with many warthogs, hyenas, birds, wildebeest and gazelles making the Mara their home. 4. Royally Romantic: It was reported that Prince William proposed to Kate Middleton in 2010, while on safari in Kenya. After spending two nights at Maasi Mara, I can see why. The sunset is absolutely breathtaking. 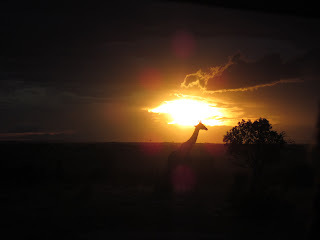 I stood in my safari van and gazed at the purple, pink, orange and blue lights dancing together in the horizon, while giraffes formed silhouettes as they moved across the plain. 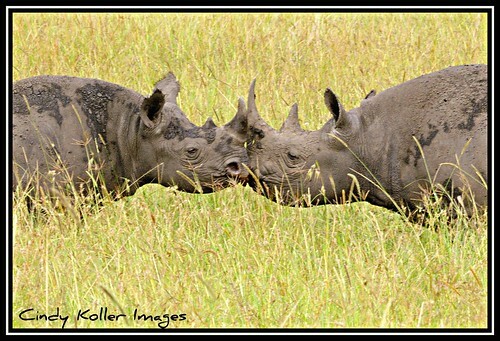 Even the Rhinos started "kissing"! 5. Living Dangerously: Nairobi is one of the most dangerous cities in the world, commonly called "Nairobbery" by locals and tourists. It is not safe to walk alone after dark because of the many pick pockets that will "help" themselves to your money. A fellow traveler told a story of a friend who had his truck hijacked in broad daylight by "uniformed policemen." Criminals are known for dressing as cops, so make sure you ask for identification before handing off goods or money to the police. Fortunately I spent only one day in Nairobi and that was more than enough time to go shopping at two major malls plus the courio market and do some sightseeing. 6. Yes You Can! : I have always thought that safaris, (other than the one at Six Flags Great Adventures) were outrageously expensive. However due to Peter's astute bargaining skills, our safari was top of the line but still affordable. This was definitely a bucket list item for me and I'm glad that I got the opportunity to do it during my stay in Africa. For those of you in the U.S., forget about going to the Caribbean or Mexico for your next vacation and plan a trip to Kenya instead! Don't forget to brush up on your Swahili and spend some time with Simba, Rafiki, Nahla, Timon and Pumba! And we're off...Peter, Elaine and I!